« Day 105 in Beijing: Butterly Effect. Day 106 in Beijing: No Stepping On The WC! Not to worry, I was fully clothed during the taking of this picture. This is an old term that most people don’t use. At least not in the USA. Maybe in other countries they still use it and I find it to be a quaint, and somewhat romantic, way of referring to the toilet. In China, as in many Asian countries, the classic way to go to the bathroom is by simply squatting where you need to go and doing your duty. And, if in a bathroom, this would be a hole dug into the ground. The easiest way to use it is to straddle the hole with your feet on either side of it. Logical. Hopefully you aren’t eating your dinner right now. Recently, western toilets are starting to gain some ground, and in Sanlitun, which is predominately an expatriate part of Beijing, they are everywhere. This can cause problems since most people that squat are used to putting their feet on the side of a hole in the ground and not resting their bottoms on a toilet seat. Think about this and what might happen if you didn’t know how to use a western toilet. You would, reasonably, climb up onto the toilet and stand on the toilet rim or toilet seat. The positioning of your body would be rather precarious. People have fallen in and hurt themselves. People also get a lot of dirt, mud, and other unmentionables on the toilet seat and rim by doing this. Therefore, it is discouraged and signs like this one are popping up more and more. I’ve tried the squat toilets when I lived in Japan and again here in Beijing. Squat toilets have been proven to be more beneficial physically for the user because the position puts less pressure on the human body. This may be true, however, I am just not comfortable doing it and my legs aren’t strong enough to hold that position. 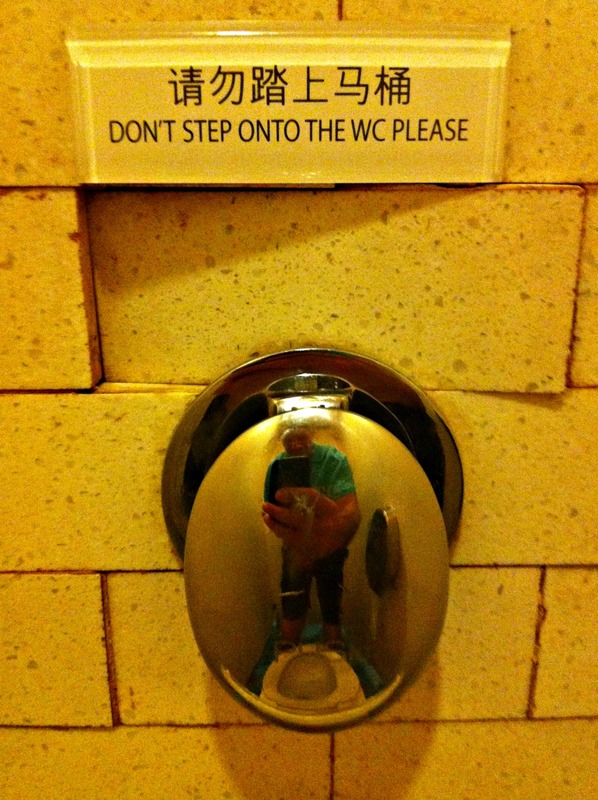 Also, I don’t want to chance my shoes, pants, or clothes touching the ground near a squat toilet. You can probably guess why. I’m not saying that western toilets are better. It is just a cultural choice for me to stick with something that I’m comfortable with at this time.